The true hero of the story of Alexander is not so much Alexander as his father Philip. The author of a piece does not shine in the limelight as the actor does, and it was Philip who planned much of the greatness that his son achieved, who laid the foundations and forged the tools, who had indeed already begun the Persian expedition at the time of his death. Philip, beyond doubting, was one of the greatest monarchs the world has ever seen; he was a man of the utmost intelligence and ability, and his range of ideas was vastly beyond the scope of his time. He made Aristotle his friend; he must have discussed with him those schemes for the organization of real knowledge which the philosopher was to realize later through Alexander’s endowments. Philip, so far as we can judge, seems to have been Aristotle’s «Prince»; to him Aristotle turned as men turn only to those whom they admire and trust. To Philip also Isocrates appealed as the great leader who should unify and ennoble the chaotic public life of Greece. «Philip – a man who not only is no Greek, and no way akin to the Greeks, but is not even a barbarian from a respectable country – no, a pestilent fellow of Macedon, a country from which we never get even a decent slave». And so on and so on. We know, as a matter of fact, that the Macedonians were an Aryan people very closely akin to the Greeks, and that Philip was probably the best educated man of his time. This was the spirit in which the adverse accounts of Philip were written. 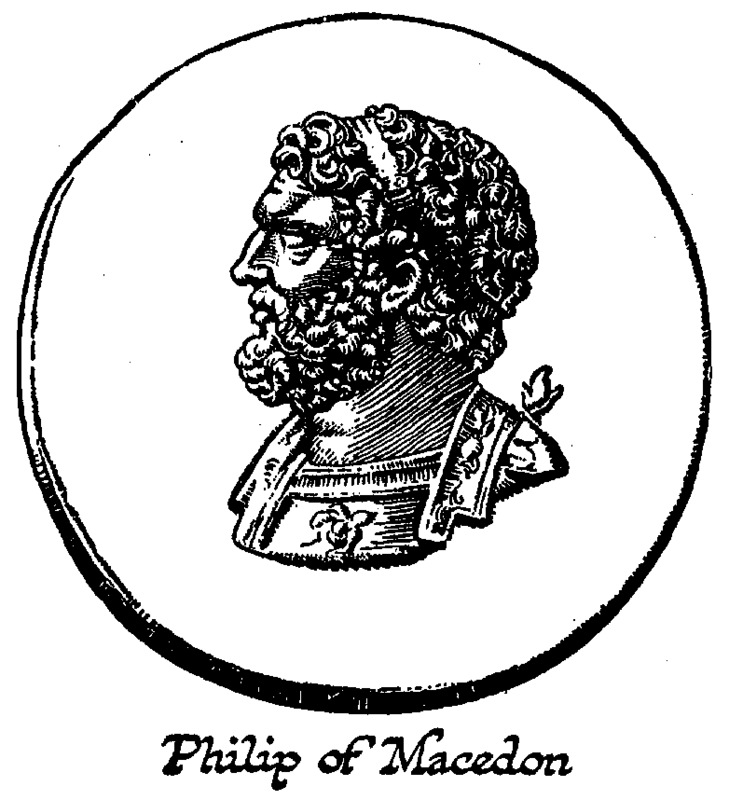 When Philip became king of Macedonia in 359 B.C., his country was a little country without a seaport or industries or any considerable city. It had a peasant population, Greek almost in language and ready to be Greek in sympathies, but more purely Nordic in blood than any people to the south of it. Philip made this little barbaric state into a great one; he created the most efficient military organization the world had so far seen, and he had brought most of Greece into one confederacy under his leadership at the time of his death. And his extraordinary quality, his power of thinking out beyond the current ideas of his time, is shown not so much in those matters as in the care with which he had his son trained to carry on the policy he had created. He is one of the few monarchs in history who cared for his successor. Alexander was, as few other monarchs have ever been, a specially educated king; he was educated for empire. Aristotle was but one of the several able tutors his father chose for him. Philip confided his policy to him, and entrusted him with commands and authority by the time he was sixteen. He commanded the cavalry at Chaeronea under his father’s eye. He was nursed into power – generously and unsuspiciously. To any one who reads his life with care it is evident that Alexander started with an equipment of training and ideas of unprecedented value. As he got beyond the wisdom of his upbringing he began to blunder and misbehave – sometimes with a dreadful folly. The defects of his character had triumphed over his upbringing long before he died. Philip was a king after the old pattern, a leader-king, first among his peers, of the ancient Nordic Aryan type. The army he found in Macedonia consisted of a general foot levy and a noble equestrian order called the «companions». The people were farmers and hunters and somewhat drunken in their habits, but ready for discipline and good fighting stuff. And if the people were homely, the government was intelligent and alert. For some generations the court language had been Attic (= Athenian) Greek, and the court had been sufficiently civilized to shelter and entertain such great figures as Euripides, who died there in 406 B.C., and Zeuxis the artist. Moreover, Philip, before his accession, had spent some years as a hostage in Greece. He had had as good an education as Greece could give at that time. He was, therefore, quite familiar with what we may call the idea of Isocrates – the idea of a great union of the Greek states in Europe to dominate the Eastern world; and he knew, too, how incapable was the Athenian democracy, because of its constitution and tradition, of taking the opportunity that lay before it. For it was an opportunity that would have to be shared. To the Athenians or the Spartans it would mean letting in a «lot of foreigners» to the advantages of citizenship. It would mean lowering themselves to the level of equality and fellowship with Macedonians – people from, whom «we» do not get «even a decent slave». There was no way to secure unanimity among the Greeks for the contemplated enterprise except by some revolutionary political action. It was no love of peace that kept the Greeks from such an adventure; it was their political divisions. The resources of the several states were exhausted in a series of internecine wars – wars arising out of the merest excuses and fanned by oratorical wind. The ploughing of certain sacred lands near Delphi by the Phocians was, for example, the pretext for a sanguinary Sacred War. Philip’s first years of kingship were devoted to the discipline of his army. Hitherto most of the main battle fighting in the world had been done by footmen in formation. In the very ancient Sumerian battle-pieces we see spearmen in close order forming the main battle, just as they did in the Zulu armies of the nineteenth century; the Greek troops of Philip’s time were still fighting in that same style; the Theban phalanx was a mass of infantry holding spears, the hinder ranks thrusting their longer spears between the front-line men. Such a formation went through anything less disciplined that opposed it. Mounted archers could, of course, inflict considerable losses on such a mass of men, and accordingly, as the horse came into warfare, horsemen appeared on either side as an accessory to this main battle. The reader must remember that the horse did not come into very effective use in western war until the rise of the Assyrians, and then at first only as a chariot horse. The chariots drove full tilt at the infantry mass and tried to break it. Unless its discipline was very solid they succeeded. The Homeric fighting is chariot fighting. It is not until the last thousand years B.C. that we begin to find mounted soldiers, as distinct from charioteers, playing a part in warfare. At first they appear to have fought in a scattered fashion, each man doing his personal feats. So the Lydians fought against Cyrus. It was Philip who seems to have created charging cavalry. He caused his «companions» to drill for a massed charge. And also he strengthened his phalanx by giving the rear men longer spears than had been used hitherto, and so deepening its mass. The Macedonian phalanx was merely a more solid version of the Theban phalanx. None of these massed infantry formations was flexible enough to stand a flank or rear attack. They had very slight manoeuvring power. Both Philip’s and his son’s victories followed, therefore, with variations, one general scheme of co-operation between these two arms. The phalanx advanced in the centre and held the enemy’s main body; on one wing or the other the cavalry charges swept away the enemy cavalry, and then swooped round upon the flank and rear of the enemy phalanx, the front of which the Macedonian phalanx was already smiting. The enemy main battle then broke and was massacred. As Alexander’s military experience grew, he also added a use of catapults in the field, big stone-throwing affairs, to break up the enemy infantry. Before his time catapults had been used in sieges, but never in battles. He invented «artillery preparation». 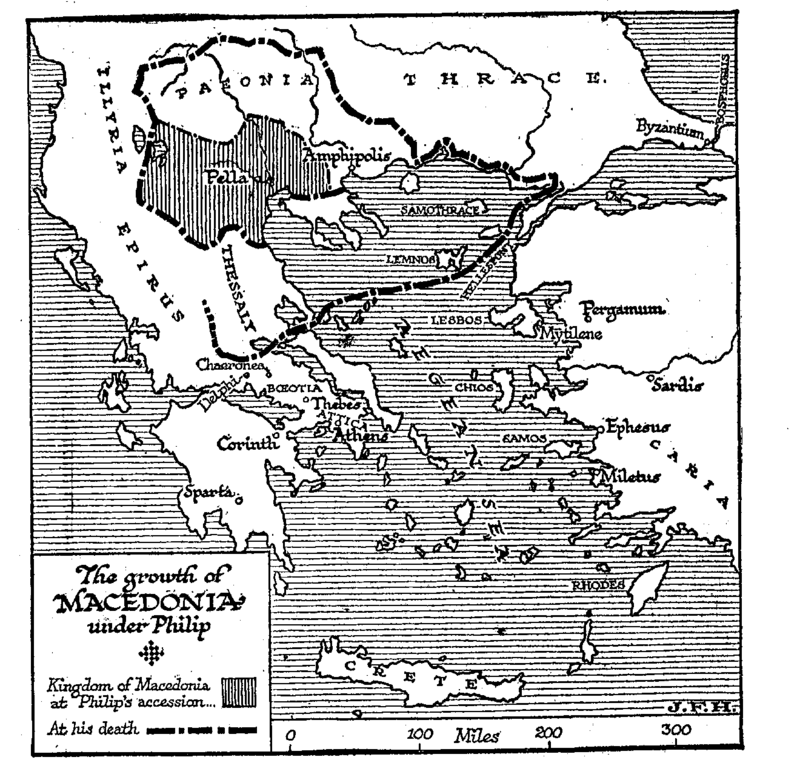 With the weapon of his new army in his hand, Philip first turned his attention to the north of Macedonia. He carried expeditions into Illyria and as far as the Danube; he also spread his power along the coast as far as the Hellespont. He secured possession of a port, Amphipolis, and certain gold mines adjacent. After several Thracian expeditions he turned southward in good earnest. He took up the cause of the Delphic amphictyony against those sacrilegious Phocians, and so appeared as the champion of Hellenic religion. There was a strong party of Greeks, it must be understood, a Pan-Hellenic party, in favour of the Greek headship of Philip. The chief writer of this Pan-Hellenic movement was Isocrates. Athens, on the other hand, was the head and front of the opposition to Philip, and Athens was in open sympathy with Persia, even sending emissaries to the Great King to warn him of the danger to him of a united Greece. The comings and goings of twelve years cannot be related here. In 338 B.C. the long struggle between division and pan-Hellenism came to a decisive issue, and at the battle of Chaeronea Philip inflicted a crushing defeat upon Athens and her allies. He gave Athens peace upon astonishingly generous terms; he displayed himself steadfastly resolved to propitiate and favour that implacable city; and in 338 B.C. a congress of Greek states recognized him as captain-general for the war against Persia. But be never followed with his main force. He was assassinated.